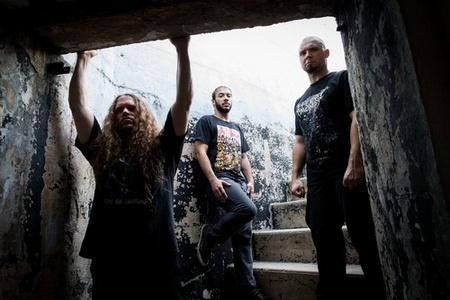 Dead Rhetoric: That actually leads into what I was going to say, in that despite the relentless pace, Hate Eternal still weaves in a lot of dynamics and memorable undercurrents into each song. Hrubovcak: I’m glad you’re saying that. That’s really excellent. Because we are writing for the song, a lot of the riffs you can walk away almost whistling them. Obviously you wouldn’t want to whistle [laughs]. You don’t forcefully try to strike a balance, but there’s always a balance. We want to go crazy, but we also want to have memorable riffs. There’s lots of artists out there that have songs that are fairly crazy technical, but really stand out and that really hit a cord and get your headbanging. That’s the bottom line, and express something internally that you want to get out. Dead Rhetoric: You joined the band back in 2009? Hrubovcak: I believe it was the beginning of 2008. I ended up doing a lot of the Fury & Flames tours. It’s been great! 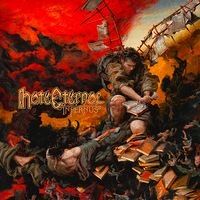 Dead Rhetoric: What have you enjoyed most about being in Hate Eternal since joining? Hrubovcak: Playing to lots of people across the world. That’s something that everyone who plays music enjoys – playing to lots of people all over. The other thing is the collaboration. I’ve always enjoying in a full band that was open to collaboration. Where you get a chance to express yourself and where you can write – as an example, “Chaos Theory” came from a 2:30 to 3:30 AM jam. That kind of stuff gets the creative juices flowing. When you’ve got everyone and you are sitting around jamming. Erik and I were just knocking off ideas back and forth. That’s what I enjoy. Also, being able to go out and see the world. Everything about the band is totally fulfilling for me. 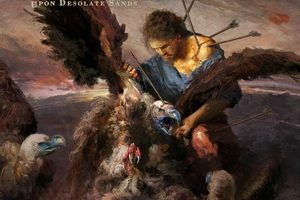 Dead Rhetoric: It’s funny that you mention “Chaos Theory,” as it seemed more like a jam session than the other songs. Hrubovcak: It’s definitely a jam session. We were knocking ideas off of each other, Erik had a guitar and I had another. Then Chason, he just went off! Especially in the middle section. That middle section is just crazy, he goes nuts! Dead Rhetoric: I wanted to switch gears to talk with you about your Death Metal Christmas album. There’s so many horrendous metal Christmas albums/songs out there that sound silly and goofy. Where did the idea to completely retool the songs? Hrubovcak: When I grew up, there were all these Christmas tunes and hymns being played in the house. A lot of these hymns seemed super dark and morose almost. I thought they sounded great! I went over to someone’s house and thought they would sound great in a death metal format. I was thinking that if I did it, I didn’t want to end up with something super cheesy. You are right – a lot of the Christmas records out there are extremely cheesy [laughs]. I didn’t want this to be a joke. I wanted a fan to be able to turn it on and say, “wow, this is good death metal.” I also wanted to get a message across lyrically. So I retooled the lyrics; I thought it would be interesting to do that, and make them dark and have some different messages in it. It’s kind of a fantasy story where a demon takes over; basically it’s about people giving up control to someone else essentially. So I wanted it to be an opposite of the joke, I wanted it to be super serious, and forget the holiday season, if someone wanted to turn it on in the middle of summer – to be able to listen and think that it was pretty decent death metal. Dead Rhetoric: Do you think that there will be another Death Metal Christmas album? Hrubovcak: I’ve been thinking about it, but I would want it to be right. The thing too, is that a lot of these super serious dark hymns, are they known to a lot of people? I wouldn’t want to put all these obscure things on there if no one knows what they are. So I don’t know. If I did it again, it would have to be dark hymns that I could retool the lyrics too, and people would be able to recognize. Dead Rhetoric: All five of the songs on the album are instantly recognizable. Hrubovcak: True. I chose those on purpose. “We Three Kings” was so dark. I remember when I was growing up, it felt extremely dark. I thought it would sound good as an almost black metal or doom feel. I actually did all the instruments on the album; I played all the guitars. I’ve played drums in the past on a lot of different records, but I didn’t have the access and I hadn’t played drums enough in the last few years, so I used a plug-in to help me out on that. I spent months and months editing everything, imagining exactly if I was sitting behind the stool, what I would want to do. Dead Rhetoric: And that was your brother that sang on it too right? Hrubovcak: Yes. He came down for a while and he did a great job; he knocked it out the park. 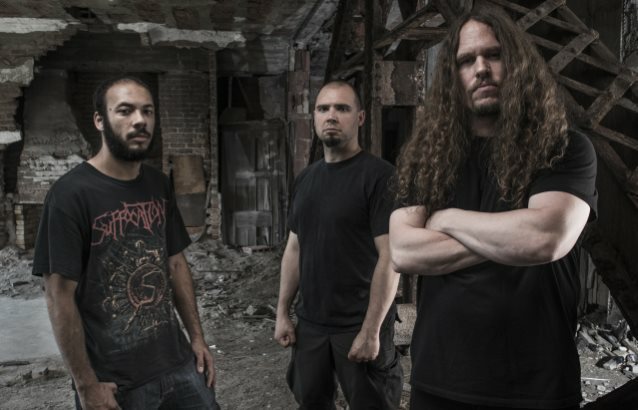 Dead Rhetoric: Switching back over to Hate Eternal, Erik is recovering; is there going to be any touring for Hate Eternal now that Infernus is out? Hrubovcak: Yes, we are working on that now. We are going to do the US, Europe, and Asia. You name it and we are trying to get there. We are trying to get all over the world again.